Anti-hunt campaigners have complained the hunting ban is not being properly enforced, according to police documents obtained by the BBC. The documents from Devon and Cornwall Police, were obtained via the Freedom of Information Act. They detail a series of letters saying police were turning a blind eye to what hunters did when animals were killed. The force strongly disputes this and said all allegations of illegal hunting were investigated thoroughly. 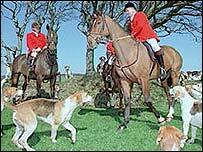 Since hunting was banned, legal forms of the sport have continued, such as horse ride-outs, hound exercise clubs and flushing foxes to guns. But despite this, the documents show complaints have been sent in to police to say foxes are still being killed illegally. One spoke of hunters "flouting the law with impunity in the knowledge that the police will take no serious action". Another said the police were "turning a blind eye". Sandy Moorhouse of the Wildlife Defence group said: "What the police haven't got is the manpower to go out into the field and catch hunters carrying out illegal activities. "We have to bring evidence to themselves and as volunteers we should not be put in that position." Devon and Cornwall Police said every report of illegal hunting was investigated. Insp Nevin Hunter said: "We are duty-bound to investigate any offences and then deal with them accordingly. "Hunting is one priority amongst a number of others." But hunters said the ban did not need policing because they were all operating within the law. Alison Hawes of the Countryside Alliance said: "What we do is no different from playing football, cricket or whatever. "You don't expect police to go out and monitor that, so why should they need to go out and police the hunts?" No-one has been charged with illegal hunting in Devon and Cornwall. Currently, two cases are still under investigation. The ban will be tested further when the hunting season resumes in September.